Hello Masters, I would like guidance on my spiritual walk. I was going to a house for mediumistic development, because I was told that I should, but for 2 years I've been going there and I do not feel my evolution, I know that my guides walk with me and help me at various times, Or see them. For some other personal problems, I looked for a therapist to help, in that therapist he told me that I should not go to this house anymore, because I do not have the mediumship to develop, and that my energy was not of that place, I was in doubt what to do , Because I like the house, but I do not feel myself evolving inside, and with what the therapist reported, it really seems that I should not be there to develop. Son. Have you asked yourself what you feel in your heart? The call to the work of charity departs from the heart. If you seek a charity only by developing your mediumship, you will not find satisfaction. For child, the true development of an incarnate being, is not of the mediumship, but of the inner truth, which can only be found through the work of bestowal in love and charity. Seek a son, that which brings the feeling of love and peace to your heart, follow where you truly feel fulfilling your purpose of just bringing love, whether in words or in the form of mediumistic work, but only one way of bringing love . HOW CAN I ADVANCE MY WAY? Dear Masters, I thank you for all the help you have given me. In my life I have been building a path of loneliness. I am alone, I have no children, I have no friends. I have co-workers, but although I like people I have a lot of difficulty living with them. My family is very hostile to me. I live with them superficially, and only with my father do I have more friendships. Rationally, I see that I have reason to stay away from most people, because I am always a friend in good faith, and people end up showing that she is not as friendly as I am. But I still want to build a family, pursuing my goals, but time is passing, and all of this gets more and more distant. I try to contact my Masters and I seek answers, I realize that my situation improves, and then I feel the same. Maybe I expect too much from others, and other people will always be more or less like this with everyone, and I resent something common. I started a business and ended up not working, I stayed two years keeping open and only losing money. The clerks were disrespectful and did not help me in anything I did. I ask beloved Masters, it helps to understand at what point of my journey I am, and how can I advance in my path. I always have headaches that I never had, I think it is related to my mental space. I am at a difficult time with a sister of mine, my superior, co-workers, and other people. What can I do to keep my energy and disposition, and to live with people, to have a family of mine? Gratitude! Ah, daughter, if you knew all that is within you, I would have a more compassionate look on you and everyone around you. I would know what is made and what the world is made of. I would know that it is pure light inserted in a planetary environment of challenges, of uncertainties, but of great learning. If you knew how everything really works, you would not have so many doubts, there would not be so much uncertainty in your heart, you would have only the love that is and the gratitude for life. But you still do not know about love, pain and everything that has added to itself in these comings and goings of earthly experience, where instead of the compassionate look created a character who judges the most unthoughtful, unloving and, why not say, dark In the sense of out of the real purpose. I would know everything if I simply opened my heart, if I would listen and let my presence be manifested in you, if I did not block what you are. And he will do so by looking upon all with kindness, knowing that each has the right to make his own decision, even if he is devoid of love, for we are not responsible for it. If he knew he would calm down, he would not question himself and be at peace. And in the face of this wisdom that would come to look at life, it would become softer, which would allow you to approach everyone with a look of humility and understanding. He would not expect anything from anyone else, but he would only do his part in trying to be the best at his fingertips. And then life would become simpler and everything would flow back into you. If he had known, if he let himself be known, it would have been simpler. Seek this truth within you, that I will radiate you with all our love. WHY DO I FEEL INDISPOSITION IN THE LAST MONTHS? In recent months I am very unstable energetically, some physical symptoms in the back and an indisposition at times. I feel that this malaise comes from outside energies and I also know that there is something in me that is allowing me to achieve this. I would like help identifying these aspects to dedicate more energy to my mission of life and even to enjoy this magical planet. Infinite gratitude! Daughter of light and love. Have you received guidelines indicating that you need to look within yourself, and find the points that make you vulnerable to the energies of environments and lower thinking forms, daughter? Realize that everything you feel comes from the inner environment of your Being, for nothing external can achieve it when it radiates light from the inside out. Work, daughter, in the light of the light from the inside out, for everything and everyone, and you will feel the symptoms alleviate. With love. WHY DID I RECEIVE REVELATIONS OF WHOM I WENT IN PAST LIVES? I have much to thank God for allowing me this incarnation, at such an important and beautiful time for the humanity of this Planet Earth. I have much to thank for all the Spiritual Guides, the Archangels, the Elohim and the Masters that accompany me in this and other Journeys to be of any size. I have two guiding questions. The first is about my Root Chakra that lately smells like Flowers. I even thought it was a thing of my head, but recently the pleasant odor has intensified more. What does that mean? 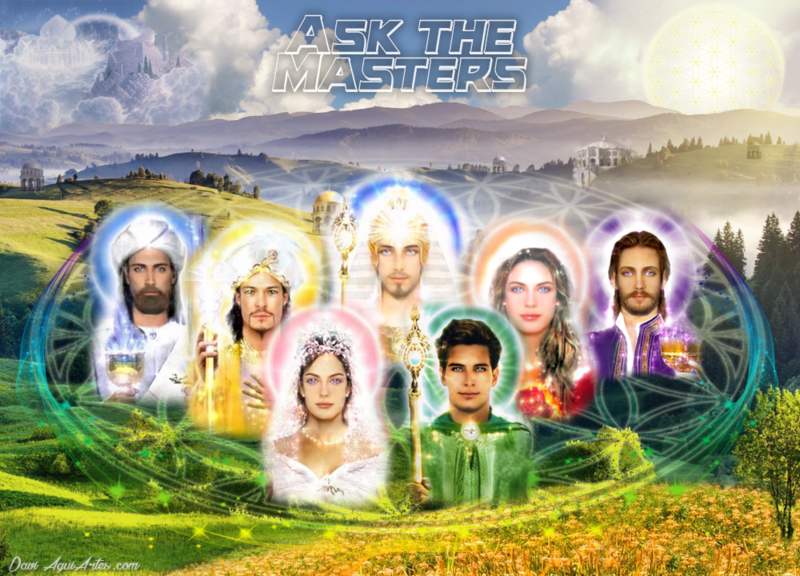 The second question is a revelation, at least I think, the names of my parents have been revealed to me in a past incarnation, and although they are brothers who join us to anchor our truths and get closer to God, they are the Ascended Masters. One of them answered a question I asked on this channel. I'd rather not say names, because anonymity is a beautiful grace. I prefer to live in Peace in materiality, but knowing this now means what? Gratitude for the attention and signs that the Universe has revealed to me. Daughter, I come to you again to bring some important revelations. The pleasant aroma you feel in your chakra is justified by the fact that there are indeed plants and flowers emerging from your feet on a multidimensional level. And these can not be observed on the physical plane, but you are uniting and merging more and more to your other manifestations on different planes. The fact of feeling the aroma is a result of its sensitivity more and more raised. That's natural, daughter. About the history of Alma, where he incarnated in previous experiences with different personalities, only serves to realize the fact that has already assumed countless personalities, opinions, and lived with different energies throughout his Alma story. But do not cling to this information by rekindling the feeling of searching for answers. Remain in your peace, being in balance with all that is revealed to you, and accepting only that which is revealed to the point which has been revealed. Just understand that your quest is the disconnect with the personalities, so in some moments you can be shown the different personalities you have justly assumed so that you understand that you have to get rid of all this. Remaining surrendered only to the present experience without identifying itself with the current personality nor with the old ones. Remain only in this certainty that you occupy a physical body so that it unifies to your I Am, as this occurs, more and more you will feel that these personalities presented to you will no longer correspond with what you will become. I involve you in this moment in the peace of your truth and give you child, into the unity of your I Am. And so it is! HAVE I ALREADY PAYED MY PROFESSIONAL KARMA? SHOULD I BUILD MY OWN BUSINESS? I want to know from my professional, if I should start my own business, in parallel to my work. About my professional karma, have I been able to pay? What do I need to improve in this area? I would also like to know about my mother how I should act, for she is getting very old. Daughter. There are many mental schedules active in you, but the one that most influences your attitudes and your life is fear. This programming causes anxiety in view of what can happen, and brings the feeling of insecurity about life, which prevents you from daring, from risking. Before you even start something, work on that feeling within yourself, to start new journeys, always aligned with your purpose. You need to work on deprogramming the feeling of fear, through therapies, self-observation and meditation. Look for help in floral therapy, homeopathy, seek your balance. Work to eliminate the feeling of fear, which is why you can not move forward in new challenges. Today there is nothing that you can worry about, it happens that brings to the present the feeling of fear of something going wrong in the future. Work through these deprogramming and then feel when the time is right, and be sure to move on with new challenges. Cleaning up these schedules is necessary, daughter. Look for it calmly and allow time for the transformations to occur. HOW MAKING MY MISSION SOUL SMOOTHER? Hello Masters, thank you immensely for the opportunity. My question today is about my soul mission and how I can make it softer. I would like to develop spiritually and help my dear brothers. Lately I have had difficult experiences that I know are for my growth, but I feel alone despite being sure that there are a myriad of light beings protecting us. Thanks again for the opportunity. Dear brother. I'm Hilarion. Today you see your life as a burden to bear with difficulties and obstacles. But what if you observed all your experiences as learning, where only the characters act to enrich their wisdom? You know that he is rather enveloped by beings of light and helper. But you also know that we are with you only to make the yoke lighter, without interfering in your learning history. Allow yourself to learn from the experiences that are presented. Look beyond and through matter into what is intrinsic in the events that take place, so that you can then actually cease to get caught up in the events, and finally absorb the lessons. Observe everything as a practical school, where the theoretical part has already been learned, but long forgotten, because the incarnation prevents remembrance, if it is not for the connection with the I Am. Internalize your attention to yourself, observe your own reactions to the facts, and then I have sought in your library of wisdom the necessary information to awaken to the fact that it is only an experience, and finally absorb the teaching and bring together as Experience in his record of Alma. Thus are the masters formed, and so is the ascension. And so it is. Of your brother.